Contact Keohane’s Cork Funeral Directors to find out more about our full range of funeral services. Keohane’s Cork Funeral Directors will assist you in planning the funeral you want within an agreed and acceptable budget. Arrange and supervise every aspect of the funeral you yourself have chosen. We will on your behalf make all arrangements with the various elements of your chosen funeral. Pay on your behalf all third party charges, fees and cost associated with your chosen funeral. We can provide a funeral to suit everyone’s circumstances. Please call +353 21 4311000 anytime. 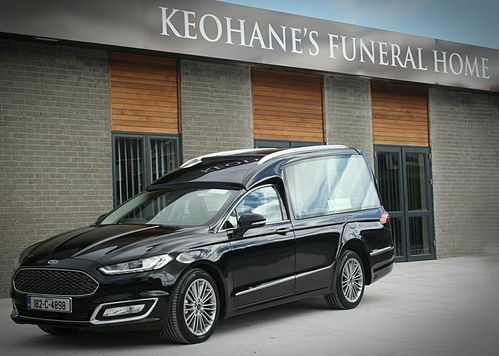 Keohane’s Cork Funeral Directors can provide transport for your family at your time of need. We use only modern hearses and funeral cars, as they reflect the constant high level of service that we provide. Our Ford Deacon Hybrid Hearse is a welcome addition to our fleet which will provide all family’s with an eco-friendly funeral procession. We feel it is the right decision to make an effort and be more environmentally conscious in their funeral homes with this in mind they feel it is a good start putting the Hybrid Hearse into service. Ford has a long tradition going back in Cork over the last 100 years and continuing on this, it is a perfect acknowledgment bringing the Ford Hybrid Hearse into service in Cork in Henry Ford’s favourite colour black. Keohane’s Cork Funeral Directors can notify all local newspapers and radio about the death notice of the deceased as requested by the family. We will also notify www.rip.ie for the online death notice. Embalming is a service both to the deceased and to the living which is carried out by trained and qualified embalmers. Embalming allows the deceased to be presented with natural colouring and the absence of odour or other unpleasant changes which would otherwise follow soon after death. We supply fresh and silk floral tributes. Floral tributes can range from a humble rose to more extravagant funeral wreaths. These typically are arranged as a traditional spherical wreath, or the more common oval or diamond shape spray. We will organise for all the flowers to be placed on top of the coffin in the church and hearse. We offer a complete cremation service. The service can be a Religious or secular service and can take place in a Church, Funeral Home or at the Crematorium. The ashes can be interned in a family grave or scattered at a favourite place. A Headstone represents a fitting tribute and a symbol of remembrance for a loved one; we can have headstones and surrounds erected. We can also have additional inscriptions cut in existing headstones. We also can have existing headstones cleaned and restored. A Pre-Paid Funeral Plan allows any person the opportunity to plan in advance, and make financial provision for a funeral sometime in the future. Pre-Paid Funeral Plans are often used to give assurance that the costs of a funeral will not be a source of difficulty, especially to relatives and friends. They are sometimes used to order and thereby guarantee desired funeral arrangements. This is a service whereby the remains of a deceased are either returned to their home country or returned from abroad to Ireland for burial or cremation. If a loved one has passed away overseas, please contact us on 021 4311000 and we will make all the necessary arrangements to have their remains brought back to Ireland.